This Neo-Western thriller is evidence of the diversity of the Crime Fiction Genre, as well as how thought-provoking it can be, making us question our own values, and those of others. Questioning is something Ty (Tyler) Dawson, the sheriff of Meriwether County, has to come to terms with - as trouble comes to Oregon. The novel opens in 1970’s America, as the winds of change ripple around this small town, and throughout the land. The 1960s are well and truly over. Our cultured and well educated Sheriff soon finds himself trying to keep the peace in this rural backwater. What starts initially as some livestock thefts, soon escalates into something more troubling. It appears that some of the local residents are wary of the folk in Rainbow Ranch, pointing fingers at the assortment of misfits, living the hippie lifestyle in this Oregon farmland community. 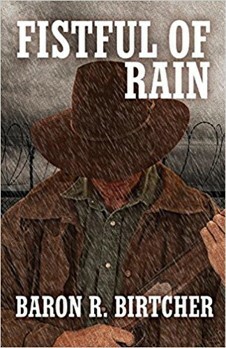 Though a sequel of sorts to South California Purples, which introduced Birtcher’s protagonist, Ty Dawson, it reads like a standalone as the Sheriff tries to restore order, when trouble comes to town. Written in style that makes one think about life, and the nature of strangers as well as what the term ‘community’, actually means – we follow the escalation in tensions between the locals and the outsiders as well as the enigmatic Deva Ravi until there is death, plural. Birtcher’s narrative is peppered with a diverse array of characters who circle the tale with rich dialogue and insight. The novel is a pleasure, as the author holds the reader in a firm clasp, reminiscent of the late great Elmore Leonard, with terse descriptions jimmied with conversations and talk that make one ponder about life, until the dénouement arrives and changes things, as the threads are tightened into a Cattleman’s lasso, making the reader take stock. Highly recommended, because like Delos, in TV’s Westworld, little is what it seems in Meriwether County, Oregon.